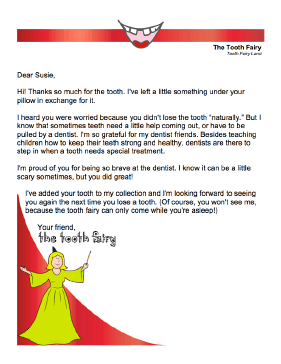 Sometimes kids worry that the Tooth Fairy won't pay for teeth that were pulled by the dentist. This printable letter assures them this is not the case and thanks the child for his or her patience. Hi! Thanks so much for the tooth. I've left a little something under your pillow in exchange for it. I heard you were worried because you didn't lose the tooth "naturally." But I know that something teeth need a little help coming out, or have to be pulled by a dentist. I'm so grateful for my dentist friends. Besides teaching children how to keep their teeth strong and healthy, dentists are there to step in when a tooth needs special treatment. I'm proud of you for being so brave at the dentist. I know it can be a little scary sometimes, but you did great!